Some History on the Roop family. The first Roop to live in the southwestern area of Carroll County was Martin Roop, the father of John King (J.K.) Roop; whom we consider to be the founding father of Roopville. Martin grew up, met and married Mary Elizabeth King (1839), while they were still living in Union County, SC. In the 1850's they moved to the area where Roopville now stands. Martin and Elizabeth had 11 children. J.K. was the oldest son of Martin and Elizabeth Roop. In 1861 he enlisted in the Confederate Army serving in both Company D of the First Regiment of Georgia Infantry and in Phillips Legion Calvary. He married Eliza Moore in 1872. To this union were born 5 children. J.K. became the owner of over 2000 acres of land, much of which he donated to enhance the growth of the area. He built several stores, a mill, a blacksmith shop and homes which he would sell to new people coming into the area. 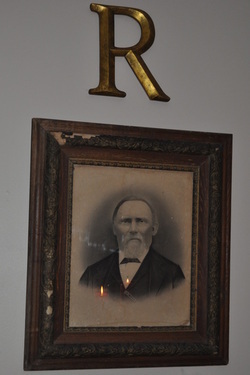 J.K. was a charter member of Roopville Baptist Church, Worshipful Master of Goshen Lodge 71, in 1880 and he served on the Caroll County Board of Education. Martin and Elizabeth's sixth child, Thomas M. was another important figure in Roopville's history. He was born in Coweta County, then moved with his family to the Roopville area, where he met and married Miss Florida Alexander in about 1878. They had 2 children, Benjamin Frank and Mary E. Roop. In November of 1882, Thomas M. (Bud) became Roopville's first postmaster, at which time the city was named Roopville in honor of Thomas M. and J.K.'s father, Martin Roop. Thomas also worked with his brother, Benjamin Josephus at Merrell's Mill in Heard County. It was at the mill in April 1883 that Thomas's life was taken, when he drowned in the terrible flash flood of the Hillabatchee Creek. Mrs. Florida and the children remained in Roopville living in the "Roop House", which she and Thomas had acquired from J.K. and Elizabeth. She later married Dr. Francis Marion Brock. They had 2 children. Mrs. Florida raised all her children here and remained in the house until her death in 1954. Her son, Frank Roop, never married and continued to live at home, in the " Roop House", until his death. Restoration began on the Roop House in 2005 with grants from The Community Foundation of West Georgia, Caroll Electric Membership, individuals, and support from the Town of Roopville. The property was bought from Evelyn Fullbright which was the present owner. However, Ms. Fullbright has not resided at the Roop House for several years. The first restoration was to clean the home of debris that had accumulated with many years of neglect and abuse from the elements. Many volunteer hours went into the intial refurbishing of the heating, electrical and plumbing system with the volunteers using one of the two fireplaces for heat. Much of the wood work was accomplished with the assistance from the Carroll County Sheriff's Department Work Crew. The home was furnished with items found in the process of restoration, items donated by members of the community that feel a connection to the Home as the roots of Roopville, and actual family members that still hold fond memories of life at the Roop House. It is a splendidly preserved home for the Roopville Archives and Historical Society, Town of Roopville and all members of the community.